Style Counsel, maintains this website for its own marketing purposes. Please visit us frequently, browse our pages, and download documents, subject to the terms and conditions set out below. Copyright © 2011 Style Counsel, Inc. All rights reserved. This website, and the information which it contains, is the property of Style Counsel and its affiliates and licensors, and is protected from unauthorized copying and dissemination by United States copyright law, trademark law, international conventions and other intellectual property laws. Style Counsel is a trademark of Style Counsel, in the United States and certain countries. All Style Counsel product names and logos are trademarks or registered trademarks of BUSINESS. All other company and product names and logos are trademarks or registered trademarks of their respective owners in certain countries. Use of any Style Counsel Website, and its Content Information contained in this website is for general guidance on topics selected by Style Counsel and/or its clients. Such information is provided on an "as is" basis, without any knowledge as to your industry, identity or specific circumstances. The application and impact of relevant laws will vary from jurisdiction to jurisdiction. There may also be delays, omissions, or inaccuracies in information contained on this website. The information on this website is provided with the understanding that Style Counsel and various authors and publishers' providing such information does not constitute the rendering of legal, accounting, tax, career or other professional advice or services unless specifically stating to such. As such, information on this website should not be relied upon or used as a substitute for consultation with professional advisors. Nothing contained on this website should be construed as granting, by implication, estoppels, or otherwise, any license or right to use this website or any documents displayed on this website, through the use of framing or otherwise, except: (a) as expressly permitted by these terms and conditions; or (b) with the prior written permission of Style Counsel. The information on this website is believed to be complete and reliable; however, the information may contain technical inaccuracies or typographical errors. Style Counsel reserves the right to make changes to document names and content, product specifications, or other information without obligation to notify any person of such changes. references to products or services that are not available or approved by the appropriate regulatory authorities in your United States of America. Such references do not imply that Style Counsel intends to announce or make available such products or services to the general public, or in your United States of America. Consult your Style Counsel account representative to determine which products and services may be available to you. INFORMATION AND DOCUMENTS, INCLUDING PRODUCT SPECIFICATIONS, PROVIDED ON THIS WEBSITE ARE PROVIDED "AS IS." SPECIFICALLY, BUT WITHOUT LIMITATION, Style Counsel DOES NOT WARRANT THAT: (i) THE INFORMATION ON THIS WEBSITE IS CORRECT, ACCURATE, RELIABLE OR COMPLETE; (ii) THE FUNCTIONS CONTAINED ON THIS WEBSITE WILL BE UNINTERRUPTED OR ERROR-FREE; (iii) DEFECTS WILL BE CORRECTED, OR (iv) THIS WEBSITE OR THE SERVER(S) THAT MAKES IT AVAILABLE ARE FREE OF VIRUSES OR OTHER HARMFUL COMPONENTS. Style Counsel SPECIFICALLY DISCLAIMS ALL REPRESENTATIONS, WARRANTIES AND CONDITIONS, EITHER EXPRESS, IMPLIED, STATUTORY, BY USAGE OF TRADE OR OTHERWISE, INCLUDING, BUT NOT LIMITED TO, ANY IMPLIED WARRANTIES OF MERCHANTABILITY, NON-INFRINGEMENT, TITLE, SATISFACTORY QUALITY OR FITNESS FOR A PARTICULAR PURPOSE. Style Counsel periodically adds or updates the information and documents on this website without notice. It is the user's responsibility to ascertain whether any information downloaded from this website is free of viruses, worms, Trojan Horses, or other items of a potentially destructive nature. This website may contain links to non- Style Counsel websites. These links are provided to you as a convenience, and Style Counsel is not responsible for the content of any linked website. Any outside website accessed from the Style Counsel website is independent from Style Counsel, and Style Counsel has no control over the content of that website. In addition, a link to any non- Style Counsel website does not imply that Style Counsel endorses or accepts any responsibility for the content or use of such a website. In no event shall any reference to any third party or third party product or service be construed as an approval or endorsement by Style Counsel of that third party or of any product or service provided by a third party. Style Counsel makes no representation that information on this website is appropriate or available for use outside the United States or Canada. Those who choose to access this website from outside the United States or Canada do so on their own initiative and are responsible for compliance with local laws, if and to the extent local laws are applicable. Any information including, but not limited to, remarks, suggestions, ideas, graphics, or other submissions, communicated to Style Counsel through this website is the exclusive property of Style Counsel. Style Counsel is entitled to use any information submitted for any purpose, without restriction (except as stated in Style Counsel' Privacy Statement) or compensation to the person sending the submission. The user acknowledges the originality of any submission communicated to Style Counsel and accepts responsibility for its accuracy, appropriateness, and legality. All disputes arising out of or relating to these Terms and Conditions shall be finally resolved by arbitration conducted in the English language in Orange, New York, United States of America, under the commercial arbitration rules of the American Arbitration Association. The parties shall appoint as sole arbitrator a retired judge who presided in the State of New York. The parties shall bear equally the cost of the arbitration (except that the prevailing party shall be entitled to an award of reasonable attorneys' fees incurred in connection with the arbitration in such an amount as may be determined by the arbitrator). All decisions of the arbitrator shall be final and binding on both parties and enforceable in any court of competent jurisdiction. Notwithstanding this, application may be made to any court for a judicial acceptance of the award or order of enforcement. Notwithstanding the foregoing, Style Counsel shall be entitled to seek injunctive relief, security, or other equitable remedies from a United States of America District Court or any other court of competent jurisdiction. If any part of these terms is unlawful, void, or unenforceable, that part will be deemed severable and will not affect the validity and enforceability of the remaining provisions. Style Counsel may, at its sole discretion and without notice, revise these terms at any time by updating this posting. This is the entire Agreement between the parties relating to the subject matter herein and shall not be modified except in writing signed by both parties or by a new posting by Style Counsel, as described above. Colors, sizes, shapes, what's your pick? 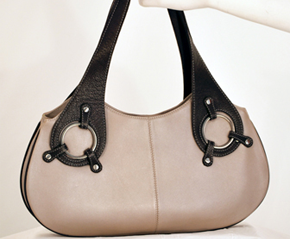 We have purses and totes that go with any look you create!